XNAV - or X-ray Navigation - could be the GPS of the solar system (or even the galaxy). X-ray astronomers have mapped a substantial number of x-ray pulsars whose pulsed emissions are as regular as atomic clocks. Several papers will be presented at the IEE/ION PLANS 2008 conference describing how this idea could be applied for spacecraft navigation. 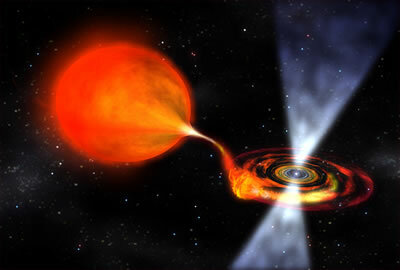 An X-ray pulsar is a magnetized neutron star in a binary star system with a normal companion star. The strength of the magnetic field of a neutron star is a trillion times as large as the Earth's magnetic field strength measured on the Earth's surface. Material from the companion star is taken in by the neutron companion, directed into the magnetic poles. This gas falls into the neutron star at speeds of up to half the speed of light; the resulting hotspots generate temperatures of more than a million degrees. As the neutron star rotates, these polar hotspots produce regular pulses of x-ray radiation like lighthouses. These sources are highly reliable, and are fixed in position. Phase measurements of these sources can be used to establish the location of a spacecraft. Several different improvements to the use of X-ray Navigation have been proposed. In Noise Analysis for X-ray Navigation Systems, it is suggested that the performance of an XNAV system beyond the orbit of Jupiter could be accurately predicted. In Online Time Delay Estimation of Pulsar Signals for Relative Navigation using Adaptive Filters it is suggested that the positions of two spacecraft could be determined if both are locked to a known pulsar which emits a waveform that reaches them with a differential time delay that is proportional to the distance between the spacecrafts. The spacecrafts' relative inertial position could be determined by observing appropriately distributed pulsar sources. Astronomers have thought long thought about pulsars, which were discovered in 1967, as some kind of interstellar beacon. The incredible regularity - and rapidity - of the signal pulsation seemed (at that time) to have no natural explanation. "We use the three-day variable to denote the galactic travel lanes. Very effective. We use the longer variable types for other things - dangerous places like cloud-drifts, or a dead sun that might be as deadly to a spacecraft as a shoal is to a seagoing vessel. It's all very logical." "...you're going to make a variable star out of Sol, just for this?" Scyth Radnor shook his head. "Please do not think us hard... You're not going to insist that your animal comforts are more important than the functioning of a galaxy-wide civilization?" From IEE/ION PLANS 2008 via io9.